Solidarity with Floyd Dent, April 1. Detroit — Millions of people around the United States have seen the video of the brutal beating and choking of Detroit resident Floyd Dent by police in nearby Inkster, Mich. A squad car’s dashboard camera documented the Jan. 28 assault and the video has since been widely viewed. After being pulled over for an alleged stop sign violation, Dent opened his car door and showed his hands. He was immediately dragged from his vehicle, punched, put in a headlock and tasered three times by police. Dent spent two days in the hospital with four broken ribs, a fractured left orbital and blood on the brain. Dent, a 37-year Ford worker and member of United Auto Workers Local 600, has mass support. Dozens packed the courtroom on April 1 when he pled not guilty to drug possession. After viewing the video, a judge had previously thrown out charges of assault and resisting arrest. Judge David Groner granted a two-week postponement for discovery purposes. Close to 100 supporters picketed the Inkster police station that afternoon. Dent’s attorney, Gregory Rohl, is still seeking the names of all the officers involved in the beating as well as the mug shot video that shows the extent of Dent’s injuries. Speaking to the media, Rohl challenged the police claim that crack cocaine was found in the vehicle. The video showed a police dog detecting nothing and the bag of “evidence” does not have Dent’s fingerprints. Dent also aced a polygraph. 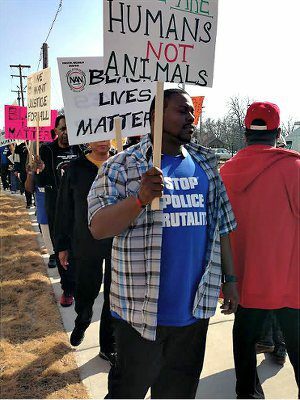 Several hundred people marched April 3 from the site of the beating to the police station. The march was called by the Michigan chapters of the National Action Network along with the Council on American-Islamic Relations and Take on Hate. Supporters included Detroit Black Lives Matter, the Moratorium NOW! 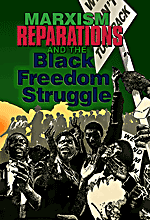 Coalition, the Detroit Coalition Against Police Brutality, the Detroit Coalition of Black Trade Unionists, retired Rev. Ed Rowe of Central United Methodist Church, U.S. Rep. John Conyers Jr., former state Rep. Rashida Tlaib and several dozen UAW activists. The Detroit suburb of Inkster is nearly 75 percent African American. Over 80 percent of the police force is white, including the chief. With the exception of William Melendez, who is Latino, all of the cops at the scene of Dent’s beating were white. Melendez, who was seen punching Dent in the head at least 16 times, earned the nickname “Robocop” during his 16 years on the Detroit police force. By the time his scandal-ridden career there ended in 2009 over falsified reports, he had developed a reputation for wrongfully arresting people, planting fake evidence and lying under oath to cover up his misdeeds. He shot and killed Lou Adkins in 1996 and Ernest Crutchfield III in 2003, both unarmed. At one point, Robocop led the department in citizen complaints and lawsuits filed against an officer. In 2010, Inkster hired Melendez, fully aware of his record. Inkster police Chief Vicki Yost also came from the Detroit force. As partner of officer Eugene Brown when he murdered Lamar Grable in 1996, she testified on Brown’s behalf in a civil lawsuit. Despite this and other controversies, Yost moved up the ladder in Detroit but left in 2014 to become Inkster’s head cop. The protests have demanded that Robocop and Yost be fired.